We’re finally just in the process of updating our living room. This has been rather a long time in coming as we bought the house about three years ago now, but with a bit of a lack in funds, it’s taken us rather a while to get round to it! Our priority was to change the carpet. The old one was a kind of faded burnt orange colour which eventually, and not through lack of cleaning efforts, was just riddled with stains from spillages and generally grubby children! Our new carpet is a darkish slate grey which has a silvery element to it, which we chose on purpose by matching samples to the current stains on the carpet and selecting the one that best matched! Ok – so the method was a little unorthodox, but it’s worked, and the carpet is fabulous and is also supposedly bleach-able! Which is just wonderful with a house of clumsy kids and sticky fingers! Now for the rest of the living room though. We have already picked a pair of NEXT Home sofas, and we are having some white wide slatted blinds fitted into the bay window because, being south facing, the light just streams through the living room throughout the day, and whilst this is lovely and warming, it can be quite blinding, so rather than just pulling the curtains, it will be nice to just tilt some blinds slightly so we don’t have to live in permanent darkness!! And then to the other elements of the room. I am very into grey at the moment – so much so that my house is very seriously in danger of becoming one big grey canvas! 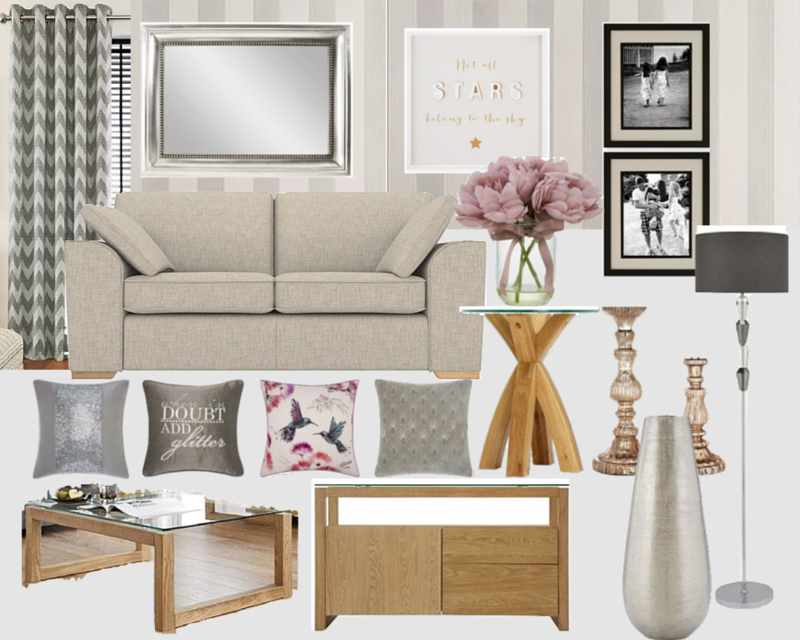 So what I plan is to have a base colour palate of greys, whites and blacks (yes – probably throughout the house) and to just accessorise with hints, bursts and pops of colour here and there, which will be easy to update as my mood changes! Although we’re going to have the blinds in the windows, I am still keen to have some dress curtains down each side of the window. Don’t ask why, I just find the look a little cosier, and with me loving modern/contemporary design and my husband keen on the more traditional and homely, this is the compromise. I’ll let you know how we got on once its finished! And more about the colour elements next time!!! But in the mean time – here are some of the styles I’m rather loving for my NEXT Home : Grey Living room inspiration in grey. Next Post Golf is boring!! ooh lovely picks! Make me want to redecorate NOW! Everyone seems to be loving grey at the moment, I am not sure Mr F would let me buy all new things but I do love it! Looking forward to seeing the final outcome! I love grey, I actually decorated little A’s nursery in grey and accentuated with blue. Do you have any photos of your finished living room?